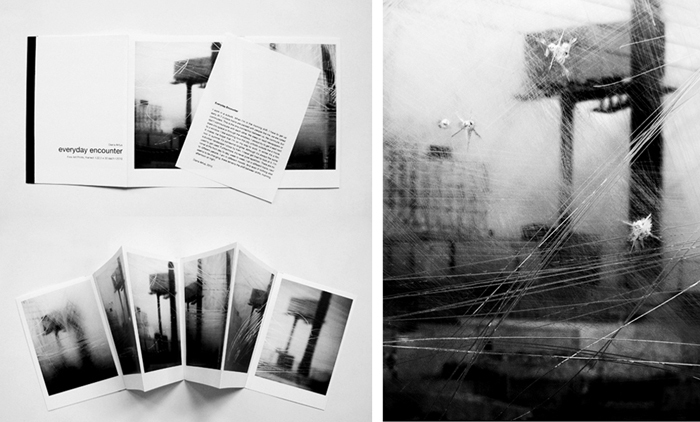 Digital print, Leporello (handmade binding), 21 x 15 cm, 2010 (Edition of 50). Digitaldruck, Leporello (handgebunden), 21 x 15 cm, 2010 (Edition von 50). The leporello contains all images of the work Everyday Encounter (2010) and a short text (English) written by Diana Artus. Das Leporello enthält alle Motive der Arbeit Everyday Encounter (2010) und einen Kurztext (Englisch) von Diana Artus.